Scottish civil servants have backed strike action in protest of the government's sub-inflation pay offer. The PCS union expressed anger that the Scottish Government had proposed to cap pay rises at 2%. Three other public sector unions - Unison, Unite and the GMB - have also balloted for action over pay. Union bosses claimed industrial action could hit policy delivery, ministerial visits, answers to Scottish parliamentary questions and operations at the Registers of Scotland. Eddie Reilly of the PCS, which has about 35,000 members in Scotland, said: "In spite of daily pressures of rising food costs, travel, gas and electricity, PCS members in the Scottish Government and Registers of Scotland have demonstrated the strength of their anger over the proposed pay cut." 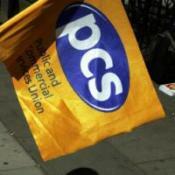 PCS Scottish Government members narrowly backed strike action, with 931 voting for and 913 against, on a 54% turnout. The government claimed the result of the vote showed that workers realised it had done as much as possible on the issue. A total of 1,261 voted for non-strike industrial action, with 500 voting against.